Delivering quality chiropractic care to the Soquel / Santa Cruz area since 1970. Chiropractor in Soquel, Dr. Thibodeau's gentle holistic approach and natural solutions for many common health issues have improved the lives of many Soquel and Santa Cruz County residents. Chiropractic services are tailored to the needs of each unique patient. We have a family practice, and see people of all ages. Our services include a holistic approach based on sound evidence based chiropractic knowledge. Soquel CA Chiropractor, Dr. Thibodeau specializes in non-surgical orthopedics, neurology, pain management, nutritional and physical movement issues. He also specializes in healing injuries caused by automobile accidents, sports injuries, and workplace injuries. Thibodeau Chiropractic, located in Soquel, CA at the corner of Park Ave. and Soquel Drive, is like no other medical or chiropractic office. The environment at Thibodeau Chiropractic is one of tranquility and comfort. Decorated in calming pastels, we do not have bright lights, loud machines, or stressed staff members. 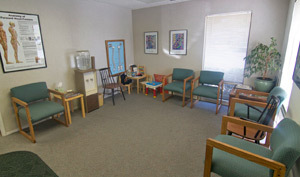 As soon as you enter our office, you will notice a peaceful and easy feeling in the air. Chiropractic can help reverse the effects of injuries caused by repetitive motion, poor posture, and poor lifting habits. At Thibodeau Chiropractic, we believe in promoting wellness through injury prevention, eating, thinking and moving well. "I believe in imparting a congruent healthy lifestyle and love to hear about my patients lives, and of course sorrows. I do my best to help and contribute to their well being. I will see patients anytime, day or night," states Dr. Thibodeau. Right now we are debating who should pay for health care, when we should debating what kind of health care we want to pay for. So when we can persuade my patients to eat, move and think homeostatically, great progress is made. The Almanac of Chronic disease 2009 brings forth that humans as a species are the sickest species this planet has ever seen. We have the sickest children, sickest teenagers, sickest adults and sickest elderly ever in the history of mankind. We can send a copy of this report to you upon request. People around the world are recognizing the benefit of seeking an alternative to traditional medicine; one that will help them achieve and maintain optimal health without requiring invasive treatments such as surgery. Please take the time to meet the chiropractor and our network of chiropractic and wellness care professionals dedicated to helping you achieve your wellness objectives. To fully understand the nature of your health, we recommend that you join our free website membership program. As a patient at Thibodeau Chiropractic we will personally tailor a chiropractic and wellness program specifically targeted to your needs using the least invasive yet highly-effective techniques and services.